This might sound like an idiotic statement but even though I thought this episode of Alphas was a pretty sizable step down from the pilot (to the point where I very nearly gave it a C), I also think it might be the episode that convinces me this show is worth following long-term. I think there are the pieces of a great show here, even if they’re not all fitting together right just yet. But once everybody involved figures out what does and doesn’t work here, this could be a lean, mean little show to be reckoned with, a superhero drama that has a lot of fun with the idea of a super-team carrying out missions, even as it allows itself to be just a little dark. When the team is out in the field, this really doesn’t LOOK like anything else SyFy has to offer right now, and that’s a good thing. I say this because the first 10 minutes of tonight’s episode or so had me sinking in my seat. With the team moving into brightly lit, spacious new offices and bouncy music plucking away on the soundtrack, I was briefly convinced the network had convinced all involved to make this show more like Eureka or Warehouse 13 than what the pilot was. Now, I don’t mind Eureka or Warehouse 13. They’re fun little summer shows with a nice escapist vibe. But that escapist vibe in no way fits the much more intriguing, darker show that was evident in the pilot of Alphas. I get why the network would want to do this. It would allow everything to stay on brand and keep the Monday night programming bloc mostly consistent. But based on the pilot, I didn’t want to be turning to Alphas for goofy superhero comedy, and I was concerned I’d signed myself up for something that was just going to get awful. Fortunately, that wasn’t the case. I wouldn’t call what followed those first 10 minutes great by any means—in particular, a poor guest star casting decision hurt a lot of the episode’s potentially powerful moments—but it was roughly entertaining and more in keeping with the tone of the superior pilot. Believe me. There were still clumsy moments scattered throughout—someone actually said “Checkmate” when our chess-piece-scattering villain did something particularly dastardly—but there was a nice attempt to play around with the idea that if there were people with mental superpowers, some of them would probably use those powers for ill. And it doesn’t go over the top with Marcus, the guy who can plan out chain reactions to several moves ahead, turning the world into his human chessboard, until pretty much the very end. His early, improbable escapes are very, very simple, mostly involving throwing things at just the right angle to get people to swerve out of the way, and seeing how he uses his powers of perception to determine the right angle to throw at was a cool visual trick. Now, granted, this is not exactly an original idea. A pretty terrific episode of Fringe used this very same power—or a nearly identical one—to great effect earlier this season, and I’m almost certain there’s an X-Files that did something very similar as well. It works so well because it allows for a chance to do cool things on a TV budget, and watching how, say, a quarter flip can lead to a giant car crash is fun, without breaking the bank. Plus, it really gives the sense that the villain is all-knowing an omniscient, even if we know he’s not. (Arguably, that Fringe episode went too far in this regard, fun as it was.) It makes him seem like someone who can never be captured, even if in the back of our heads, we’re trying to figure out how he will be. And that makes for fun TV. What doesn’t make for fun TV? Well, the crime solving here felt a little perfunctory, particularly since Marcus ended up being a pretty dull villain, never missing a chance to offer up lots of expositional dialogue in a flat, affectless manner. Every scene consisted of Marcus doing something terrible, the team arriving at the scene, everybody discovering an incredibly obvious chess piece clue Marcus left for them, some member of the team using one of their powers to suss out a clue, and then the gang moving on to the next repetition of this basic structure. And, honestly, I get that writing the crime-solving stuff is going to be the hardest thing about this show, simply because there are so many crime shows out there. And this episode showed a nice willingness to vary things up just a bit, with that pattern occasionally getting interrupted by having Dr. Rosen remember his time with Marcus or having him actually find Marcus for a while and try to reason with him. Those scenes were more tense than any scenes where Marcus was actually out, killin’ folk. Now, normally, when crime shows try to have their protagonists feel an intense connection to the suspects or victims, it can be a little silly. But here, there’s a deep thematic pull between Marcus and the rest of the group. For one thing, Rosen spent lots of time trying to make him a productive member of society back in the day, before finally giving up and turning him over to some other psychiatrist friends. And, yes, there are other elements to this, and yes, Marcus is a little unduly harsh on Rosen, but it’s easy to see just why the guilt over this has gnawed away at Rosen over the years. 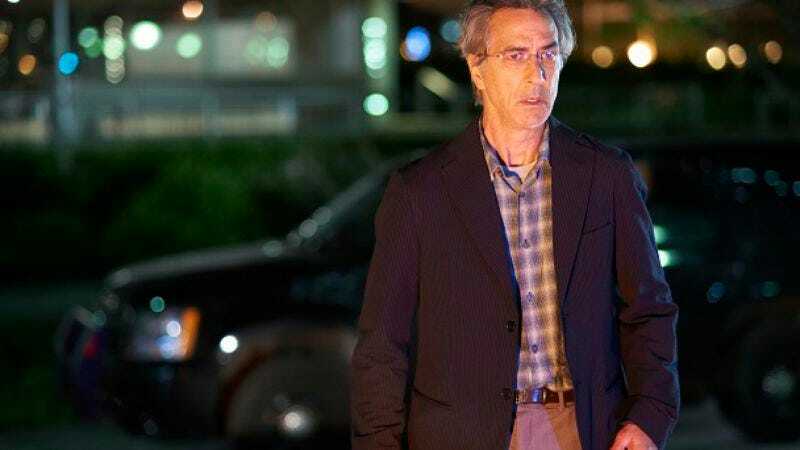 And for as often as it seems like the show is wasting David Strathairn by having him say this show’s equivalent of the kids screaming “A CLUE!” on Blue’s Clues, he brings his all in these more emotional moments. Rosen really does want to help these people, really does think that he can use whatever the Alpha phenomenon is to make the world a better place, both for Alphas and for regular old humans. But he seems to be overestimating both sides’ capacity for understanding. And, yeah, that’s straight out of X-Men and a million other comic books. But that’s because it’s just a good, old-fashioned storyline of two cultures coming into contact with each other and clashing. That’s a story that almost always works because it’s a story that has happened many, many times in actual history and will almost certainly happen many times in the future. You can call it derivative, but the series’ willingness to go for broke on this conflict—as when Nathan plugged Marcus in the chest and Marcus fell from that bridge—is the thing that signifies to me that this might be a show that’s serious about following all of these ideas through. And for all of this episode’s faults, those moments when Rosen tried to make up for his guilt and when the team questioned whether it was ultimately right to assassinate Marcus made up for everything else. With a little care, this could be an impressively hard-nosed show. Of course, Marcus didn’t ACTUALLY die. He even left a quarter for all of us to find! I dunno. This robs that ending of some of its sting, but it would be nice of the show built up a nice roster of recurring players all the same. My favorite of Marcus’ many escapes might have been the simplest: He tosses a soda bottle, causing traffic to jam up, giving him time to race off. The series aims for light, comic banter, and it doesn’t really work. It needs something grittier, though gallows humor might fit the tone of the show fairly well.